Readings: Jon 3:1-10; Lk 11:29-32. 1/ First Reading: RSV Jonah 3:1 Then the word of the LORD came to Jonah the second time, saying, 2 "Arise, go to Nineveh, that great city, and proclaim to it the message that I tell you." 3 So Jonah arose and went to Nineveh, according to the word of the LORD. Now Nineveh was an exceedingly great city, three days' journey in breadth. 4 Jonah began to go into the city, going a day's journey. And he cried, "Yet forty days, and Nineveh shall be overthrown!" 5 And the people of Nineveh believed God; they proclaimed a fast, and put on sackcloth, from the greatest of them to the least of them. 6 Then tidings reached the king of Nineveh, and he arose from his throne, removed his robe, and covered himself with sackcloth, and sat in ashes. 7 And he made proclamation and published through Nineveh, "By the decree of the king and his nobles: Let neither man nor beast, herd nor flock, taste anything; let them not feed, or drink water, 8 but let man and beast be covered with sackcloth, and let them cry mightily to God; yea, let every one turn from his evil way and from the violence which is in his hands. 9 Who knows, God may yet repent and turn from his fierce anger, so that we perish not?" 10 When God saw what they did, how they turned from their evil way, God repented of the evil which he had said he would do to them; and he did not do it. 2/ Gospel: RSV Luke 11:29 When the crowds were increasing, he began to say, "This generation is an evil generation; it seeks a sign, but no sign shall be given to it except the sign of Jonah. 30 For as Jonah became a sign to the men of Nineveh, so will the Son of man be to this generation. 31 The queen of the South will arise at the judgment with the men of this generation and condemn them; for she came from the ends of the earth to hear the wisdom of Solomon, and behold, something greater than Solomon is here. 32 The men of Nineveh will arise at the judgment with this generation and condemn it; for they repented at the preaching of Jonah, and behold, something greater than Jonah is here. I. THEME: Everybody can repent and receive God’s forgiveness. Lent is the season of repentance. Many conversed stories of sinners must inspire us to trust in God’s mercy and to return to him. For examples, none had a corrupted life as St. Augustine. Monica, his mother, wept with God and prayed for his conversion. She begged St. Ambrose to help her son to return to God, and he assured her that the son whom she had shedded so much tear for, can’t be lost. Augustine conversed and became a great saint; his writings help many people to return to God. Another great story is in St. Paul. He was on his way to persecute Christians; but after his fall on the way to Damascus, he became a jealous preacher who overcame all obstacles to bring the Gospel to the Gentiles and established solid churches for the early Church. Lastly, it is the conversion of the good thief on the cross who begged Jesus to remember him when he established his kingdom, Jesus assured him that "Truly, I say to you, today you will be with me in Paradise" (Lk 24:43). These conversions proved that everybody, no matter how bad their life are, can repent and return to God. Today readings center on the Ninevites’ conversion after Jonah’s preaching of repentance. In the first reading, Nineveh is a Gentile city, very big and deeply in sins. Even though they didn’t believe and worship the God of Israel, they repented when they heard Jonah’s preaching the first time, "Yet forty days, and Nineveh shall be overthrown!" All members of this city, from the king to people, from human beings to animals, they proclaimed a fast, covered themselves with sackcloth, and sat in ashes. They hoped that God shall have mercy on them and stop his punishment, and their hope was fulfilled: God didn’t punish them. In the Gospel, St. Luke gave us a contrasted image. Though the Israelites believed in God, and saw many of Jesus’ miracles and listened to his teachings, they were still stubborn, not only unrepentant but also challenging Jesus to perform more miracles before they can believe in him. 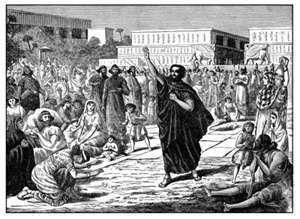 1.1/ God had mercy on the Ninevites and gave them an opportunity to repent: Nineveh was the capital of the ancient Neo-Assyrian Empire. It lays on the eastern bank of the Tigris River, across the river from the modern-day major city of Mosul, Iraq. In the time of Jonah, the Ninevites were not only the Gentiles but also the Israelites’ enemies because they completely destroyed Israel and the Jerusalem’s temple and brought people on exile to Babylon. This is the reason why the prophet Jonah disobeyed God the first time; he didn’t want the Ninevites’ conversion, but wanted them to be punished by God. Jonah couldn’t understand why God had mercy on a Gentile city who were the Israelites’ hostile enemies. Rather, he should understand that God is the Father of all people, Jews as Gentiles. If He is the Father, He must equally love His children, the good and the bad. God declared His will: “As I live, says the Lord God, I have no pleasure in the death of the wicked, but that the wicked turn from his way and live” (Eze 33:11a). (1) The Ninevites believed in God, they proclaimed a fast, covered themselves with sackcloth, from the greatest of them to the least of them. (2) When the tidings reached the king of Nineveh, he arose from his throne, removed his robe, and covered himself with sackcloth, and sat in ashes. (3) The king made proclamation and published through Nineveh, "By the decree of the king and his nobles: Let neither man nor beast, herd nor flock, taste anything; let them not feed, or drink water, but let man and beast be covered with sackcloth, and let them cry mightily to God; yea, let every one turn from his evil way and from the violence which is in his hands. Who knows, God may yet repent and turn from his fierce anger, so that we perish not?" 1.3/ God didn’t punish the Ninevites: The author reported the good result: “When God saw what they did, how they turned from their evil way, God repented of the evil which he had said he would do to them; and he did not do it.” The author of the Book of Jonah didn’t pay attention to God’s attributes, namely “unchangeable.” The Septuagint version used the verb “metanoein” which means “to repent;” while the MT version used the verb “nakham” at passive (Niphal) which means “to regret or to be sorry.” God had compassion on them and stopped what He planned to punish them. The point the author wanted to highlight is God’s love for sinners when they repented. 2/ Gospel: People must endure corresponding results for their stubborness. 2.1/ Faith can’t be based on signs: The Jews loved to see signs, they demanded Jesus to perform signs for them to believe. Jesus didn’t criticize signs because he worked many miracles; but signs are only needed to light up one’s faith in the beginning. A firm faith can’t be cased on signs because many people, though they had witnessed many of Jesus’ signs, still didn’t believe in him. To those who had a firm faith, signs are no longer needed. This was the reason why Jesus said to the crowd: "This generation is an evil generation; it seeks a sign, but no sign shall be given to it except the sign of Jonah. For as Jonah became a sign to the men of Nineveh, so will the Son of man be to this generation.” The sign which Jesus mentioned here is his death and glorious resurrection. If after they had witnessed this and still not believed, they are condemned. - Everybody can return and has a need for repentance. God gives everybody equal opportunities to repent. We must also hope and pray for others’ repentance. - We must take the opportunities when they come to learn about God and to repent, because we don’t know if we can have other opportunities like that. - Faith without deeds shall not benefit anything for us.